Recess by Narciso Desmadryl from Perkins Bacon Plates 1854 (Jan-Feb): 5 c. pale (rose) brown, wmk. pos. 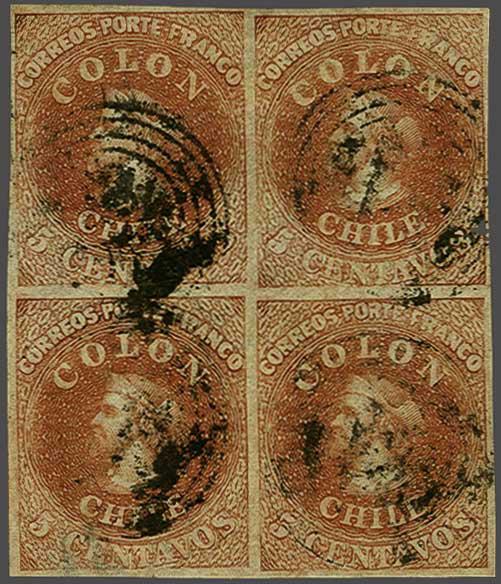 2, a used block of four with large even margins all round, some slight surface rubbing and corner crease at upper left, somewhat heavily cancelled in black. Despite the imperfections, of great scarcity as just this block of four and a single block of six exist. Cert. Corinphila (1996).rnProvenance: Collection Joaquin Galvez, Corinphila sale 62, May 1979, lot 3118; Collection 'Islander', Corinphila sale 95, Dec 1996, lot 815.